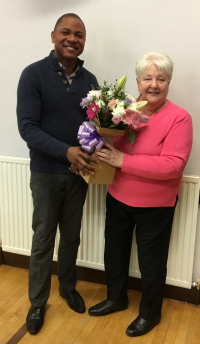 On Wednesday 13 March at the Guild AGM, Mairi Somerville was presented with a bouquet of flowers by our minister, Rev Dr Elijah Obinna as she retired from the role the Guild President. Members of the Guild would like to thank her for her years of service. Mairi has been a valued office bearer for 10 years and we hope she will serve many more as a Committee member.